Please refer to our stock # 1101 when inquiring. 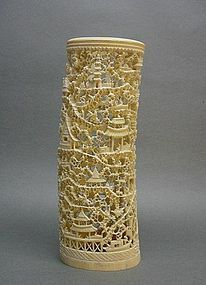 This superb late 19th century export ivory carving is 11 ¾” high, 4 ½” wide and 3 ¾” thick. It depicts daily activity in a small village. There are houses, temples and pagodas surrounded by a river, a forest of pine trees and mountains. There is an old repair on a pine tree, some small losses and several hairline cracks on the top of the tusk. Considering its age, it is in great condition.